The idea of a writing center at the State University of Iowa was born in 1934 when English Professor Carrie Ellen Stanley (photo courtesy of the Fredrick W. Kent Collection), or Miss Stanley, as she was called, taught Introduction to Literature in the basement of Jessup Hall. Miss Stanley, for whom Stanley Residence Hall was later named, met individually with her students to help them with their writing. Soon, students who had problems with writing were placed in Miss Stanley's class so that they could receive this one-on-one instruction. In 1945, when the English Department developed Communication Skills—the reading, writing, and speaking program that was the forerunner of today’s Rhetoric Department—Miss Stanley stopped teaching literature and started directing a Writing Lab or Laboratory, where, as she said, students labored to become better writers. At the same time, Communication Skills created the Reading and Speaking Labs. During Miss Stanley's tenure as Writing Lab director, the Lab was viewed as remedial, a place to send troubled or problem writers, especially those who had failed the placement or exit exams. Teachers worked with these students on a particular structure called the attitude paragraph (a topic sentence that expressed an attitude and then supporting sentences that presented examples) that would enable them to pass the exam. 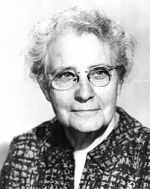 Miss Stanley retired in 1954 and was followed by a number of Communication Skills professors who took turns as Writing Lab director. An especially well-known professor who directed the lab from 1963-65 was Cleo Martin (see photo), who, along with Lou Kelly (see below), created the Professional Development Program, a learning and sharing forum for new rhetoric teachers which is still going strong today. Cleo, as she was called, was a firm believer in encouraging, affirmative responses to writing–responding to what writers are saying, not to the way they are saying it. In the 1950s, the Communication Skills Program became the Rhetoric Program, which then became the Rhetoric Department in 1988. This 1961 photo (above) shows the building that used to house the University of Iowa Writing Center until it was destroyed by fire in 1970 (below). The director whose name is synonymous with the University of Iowa Writing Lab is Lou Kelly (see photo below) who had worked two years as a lab teacher for Miss Stanley in the 40s. Kelly started directing the Lab in 1965, when Cleo Martin decided to pursue her doctorate, until she retired in 1989. From 1963 to 1968, Communication Skills and the Labs were located in Old Armory Temporary (see photo), famous for its thin, corn-husk walls, naked light bulbs, clanking radiators and excessive heat. In fact, it was so hot in the summer that Kelly demanded that the Lab be moved to 110 English and Philosophy Building (EPB), which was used during the year as a study hall. When the Armory burned during student protests in 1968 (see photo–a reaction to "the attitude paragraph"? ), the two enormous Old Armory rooms that were the Writing Lab amazingly did not burn. When Communication Skills moved to EPB, Kelly made sure she secured room 110 for Writing Lab all year where it still is today. Lou Kelly (center) with Rhetoric professor emetitus Doug Trank (left) and English professor emeritus Fred McDowell (deceased) (right). Kelly developed Rhetoric 10:09, a credit-bearing individualized writing and reading course designed to prepare students for 10:01. When so many students were signed up to take 10:09 individually that it strained the teaching staff, in 1986 Kelly designed an equivalent classroom course, Rhetoric 10:89, especially for inexperienced writers with lower ACT scores. The course required lab hours in addition to classroom hours. Often underprepared athletes took this course before 10:01, and if they didn’t work hard, Kelly made sure ex-football and basketball coaches Hayden Fry and Tom Davis knew about it. To counter the rigidity of the "attitude paragraph," Kelly created a pedagogy based on "invitations," writing assignments that took advantage of the strength of writers' voices and experiences and which were read as acts of communication from one human being to another rather than as demonstrations of verbal proficiency. In 1996, the Writing Lab stopped offering 10:89 in response to extremely low enrollments due to changes in University admissions and National Collegiate Athletic Association standards, and the belief that students would do as well with less stigmatization in Rhetoric 10:01 with optional, rather than mandatory, Writing Lab hours. In 2010, Rhetoric changed their curriculum to remove 10:01 and 10:02 in favor of an all 10:03 curriculum with 10:04 and 10:06 for transfer students who have taken speech or writing respectively. To replace 10:09 and 10:89, Rhetoric Department Chair Dennis Moore and the Writing Center collaborated with academic advising to start a non-credit, non-graded writing center tutorial called Writing for Academic Success for any student who felt less than confident about writing. In 1999, we changed our name from Writing Lab to Writing Center because to some teachers, especially those in the national writing center community, "lab" sounded too clinical and too much like a medical model of diagnosis and treatment of illness. Our new name, Writing Center, erases any remaining remedial connotations and expresses the idea that writing can be a problem for everyone (writing researcher Linda Flower said that writing is a problem-solving process). The Writing Center is now the locus for collaboratively solving problems inherent in writing, thinking, and revising. The torch of the Writing Center passed from the directorship of Lou Kelley to Allison York in 1989, and then to Carol Severino in 1991. Severino is a professor of Rhetoric. She researches the relationships between writing, language background, culture, and pedagogy. Severino has served on the editorial boards of College Composition and Communication, the Journal of Second Language Writing, the Writing Center Journal, and the Learning Assistance Review. Carol Severino in her EPB office and at the drums with her band Rough Draft. Under Severino's direction, the Writing Center has expanded noticeably. As demand for the Writing Center grew, its staff increased in number, adding tutors from across the curriculum and a receptionist position. In 2000, the Center added the appointment tutoring program, which allowed students to make as-needed appointments as an alternative to signing up to work in the Center for a whole semester. Several satellite locations opened shortly after, including those in Wild Bill’s Coffee Shop and the Blank Honors Center. In 2007, the Writing Center began offering a community writing center one night a week in the Iowa City Public Library. In 2002, with funds from the University's Writing Initiative, the center began its e-mail tutoring program (now the online tutoring program) and soon employed a full time e-mail tutor. That position expanded in scope to become an assistant directorship, and in 2008, Matt Gilchrist became the Center's first assistant director. Deirdre Egan, appointed in 2014, is the current assistant director. In 2003, in partnership with the Rhetoric Department and the Honors Program, the Writing Center created the Writing Fellows program. The Writing Fellows is a peer tutoring across the curriculum program. The program extends writing instruction beyond the departments of Rhetoric and English and encourages instructors in departments across the College to consider writing instruction part of their professional responsibility. Writing Fellows are assigned to professors' courses and work with all of their students on drafts of two major course papers. In 2012, several writing fellows were trained to tutor in the writing center and became our first undergraduate writing center tutors. In 2013, a group of trained Linguistics majors became the second group of undergrad writing tutors. The Writing Center does so much, functions so well, and is such a great place to work and learn because of the creative and collaborative energies of the staff and students. For Lou Kelly's keynote address at the 2001 Midwest Writing Center Association Conference, September 14-15, Iowa City, IA, click here. Kelly, Lou. "One-on-One, Iowa City Style: Fifty Years of Individualized Writing Instruction." Writing Center Journal Fall/Winter, 1980. 4-19. Stanley, Carrie Ellen. "This Game of Writing: A Study in Remedial English." College English 4 (1943): 423-28.